Remember, only you can tell what kind of place you want to operate, and, be prepared for evolution, both the natural selection variety and the sudden evolutionary change variety. Decide, open, watch and listen, change if necessary. 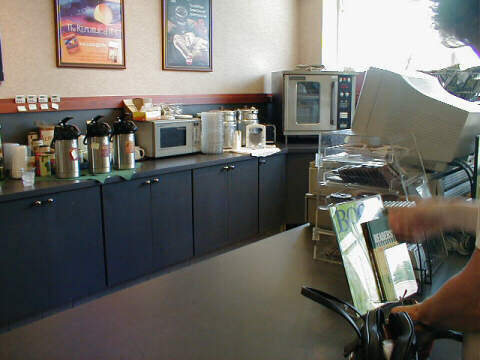 A cafe is a coffee bar, take out and sit down food service entertainment center. People go to cafe's to eat. Some have Breakfast and lunch, and some venture into dinner. You have to know food. Our cafe baked muffins and bagels and sweets and served sandwiches and salads. Some have table clothes and table service, but many are self service from a counter. I think of a cafe as a place to go to enjoy coffee, sweets, and breakfast, lunch or dinner. There may be entertainment in the evening. For our purposes here, then, I define a cafe as a coffee store with food. 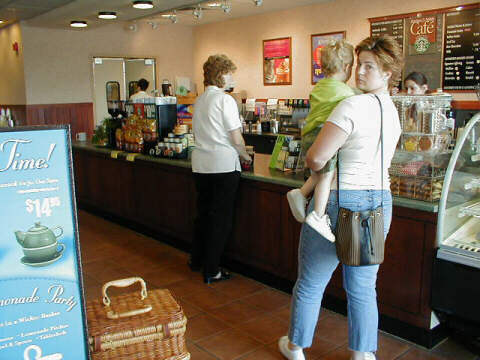 It is a totally different animal than a coffee bar or drink bar, or coffeehouse. A cafe is a place to go to eat, and to drink coffee and soft beverages and socialize and be entertained. 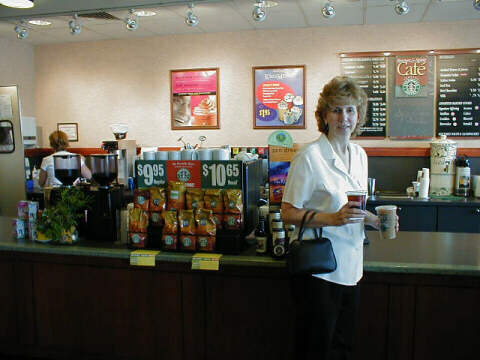 Before opening the cafe, I had a Mall Store for six years and it included drinks, beans, prepackaged, teas, cocoa, small appliances, mugs, teapots and baskets. And in the third year the Coffee Time store became the only store roasting in a mall. So I knew something about coffee before I opened the cafe. I followed my nose into the coffee business with visits to many coffee sites and the SCAA convention in Seattle in 1990. I am the kind of person who likes to learn by doing, so I created a coffee "cart and bar" for us in farmers markets and hit the road to mix it up with real people. It was great fun, a great learning experience and an inexpensive Graduate Degree with a major in Coffee. It is also very hard work and long hours. Carts are typically drink stations with some sweets. They tend to be stationary but have the advantage of mobility. Carts are now found in hospitals at key entry points or by the main elevators, in rail stations, some libraries have them although you may not have the traffic you need in a library. Carts are self contained coffee bars. They are mobile. It is terrific for this reason and can be used for special events, county fairs, one festivals, and the like. Carts may be your only business. Or, the can be a part of a saturation strategy for the town in which you live. You have a mall store and a cafe and want to serve the college and hospital. Buy some carts and get going. Get yourself a few back copies of Specialty Coffee Retailer or Fresh Cup magazines for advertisements from cart manufacturers. Join the SCAA, the Specialty Coffee Association of America and you will get the membership book and find more cart manufacturers. This is my favorite place to go. Comfortable, colorful, entertaining, library, coffee bar, bohemian or upscale or upscale bohemian. They may have light food menu's - organics and the like, and sweets - and lots of drink variety. Tables and couches, chess and checkers and maybe a DSL connection. Take out or sit down, rarely table service. Brenner's Brew in Bridgeton New Jersey is a morning coffee stop, a light lunch stop, with entertainment and poetry readings and gifts and whole bean. Barbara Brenner is doing a great job. And books galore and some used stuff. Couches, chairs and tables. Red Rooster in Ocean City New Jersey is a shop with a coffee bar, couches, papers and reading material, outside tables, lots of colorful art. In Seattle the typical coffee house has a bar, tables, lots of art on the walls and a light food menu. I opened a coffee house with morning traffic, sweets in the morning, bagels (we used a convection oven to bake them along with cookies and muffins), light lunch (salads and sandwiches), entertainment, candles in the evening, and heavy sweets (Moon cake where are you). Coffee Houses I would define generally by the absence of heavy food menu's and more of a bar and reading environment. The distinctions could be lost on us and me and may not be important. Just open what you see in your head. All of the Coffee House menu items but not the space to sit and relax. this will have a light food menu, organics, sweets, lots of drinks and pick me up stuff. Take out. Barnes and Nobel Coffee Bar down the road from the Deptford Mall in Deptford, New Jersey. This is a great, clean, efficient bar. The bar uses ground coffee supplied by the roaster and a 8 oz. cup as a scoop. They scoop out a cup of ground coffee, put it in the brew basket, and brew the coffee. This is fine, saves on two grinders and the time to grind, but requires frequent deliveries of coffee to insure freshness. Cookie cooker, Otis Spunkmeyers, soup heaters, airpots, microwave, clean counter, cash register and a candy or sweet display to tempt the paying guest. Nice signage, easy to get from SCAA or KMO, espresso machine facing the audience, prepackaged beans on the counter, logo mugs on counter, and Yohay sweets on counter. Surprised customer. 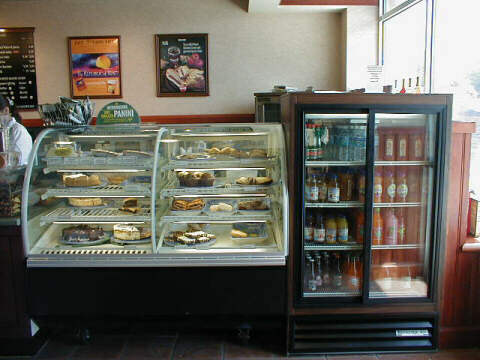 Really nice 4' cooled pastry case, and a double sliding door, self service bottled cooler for either in line use or for behind the counter. The slide makes it fast and easy to use with one hand for the lady carrying her child. The staff member is brewing and there are no grinders. Ground coffee is supplied by the roaster on a very frequent basis to insure freshness. We hope. 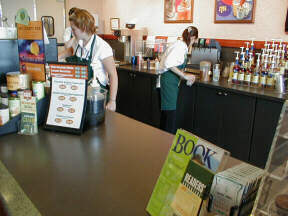 See the Cold drink dispenser, ice machine in back counter, syrups, two espresso grinders next to the espresso machine, which is facing the audience. 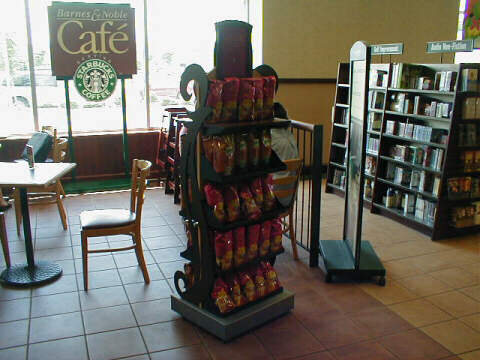 Prepackaged bean display which you can make for under $100 or buy from used display suppliers such as Gershel Brothers in Philadelphia. Logo mugs which you can buy in small quantities (100 to 500) for under $1,000 total and $2 or so each. Sell for $5 or $6. Again you see prepackaged whole bean and ground coffee. In Line: In line simply means a store that is "in the line of stores" down an aisle of the mall. Aroma and visual signals are critical to success. I would expect to see gifts, coffee accessories, beans, drinks, and baskets. Kiosk: Seasonal or permanent a Kiosk is that thing you run into in the middle of the hallway in the mall if you are talking with your wife and not paying attention to your feet. End Cap: This term also describes the end of an isle in a food store, but I use it to describe a mall site next to an anchors inside entrance. You will have gifts, coffee accessories, beans, drinks and baskets. Center Court: Yeah, like tennis, this is the place to be in a mall. In fact, I would only take a very high traffic Kiosk location or Center Court. Mall sites turnover as leases run out and it is worth waiting for a good location, especially if malls are your expansion route. Don't jump. Like people, good sites are worth waiting for. Why pick a mall? Traffic. Fast starts. This section will include the types of mall stores but for the moment under locations we have a good discussion of mall operations and considerations. Go to Malls under locations.